In 2012, Africa RISING conducted a participatory community analysis (PCA) as the first phase of a participatory development approach in the Ethiopian highlands. The PCA identified trends, constraints, and opportunities – and shed light on how farmers perceive livelihoods to be changing. Inputs, diseases, pests, soil fertility, post-harvest management, and fodder shortages were seen as challenges, while off-farm income has become increasingly important. Gender differences in livestock and crop preferences for food security and income sources were observed. The PCA established development priorities in a way that researchers may have approached differently or missed, providing research development priorities for Africa RISING scientists. Lunt, T., Ellis-Jones, J., Mekonnen, K., Schulz, S., Thorne, P., Schulte-Geldermann, E. and Sharma, K. 2018. 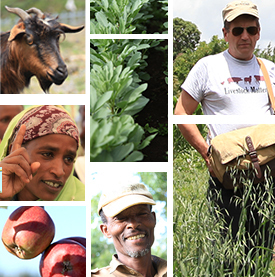 Participatory community analysis: Identifying and addressing challenges to Ethiopian smallholder livelihoods. Development in Practice 28(2):208-226. Read an earlier report from a participatory community analysis in Ethiopia. Tags: AfricaRISING, pca, USAID. Bookmark the permalink.